Okay, so they're not exactly revolutionary. But there's more going on here than appears at first glance. First, we can see from the background that we're in the world of Hercules, and judging by the cloud pillars and lightning, I'm gonna say this is Mt Olympus, home of the gods. Second, as the official Kingdom Hearts Twitter points out, the first image is a sneak peek at a new Drive Form - which also, incidentally, confirms that Drive Forms are back. 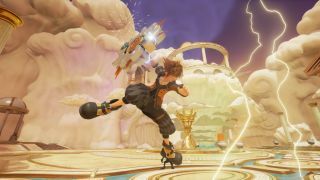 For those who never played Kingdom Hearts 2 (or have just forgotten… it has been awhile), Drive Forms are activated special abilities that give Sora a new outfit and amplified abilities. This one seems centered around defense, as Sora is wielding a shield and the form itself is called Guard Form. The second image is the more tantalizing, though frustratingly, it's enticing because of what it doesn't show. Again, the official KH Twitter account has an explanation: "This power form was edited as it is the Keyblade from a world that hasn’t been released yet, so it has changed into a hammer shape." In other words, the Keyblade hiding in that white light is tied to an as-of-yet unrevealed world, and there aren't many clues as to what it could be. I'm not deducing anything from Sora's red-and-black outfit, nor can I think of such a large weapon from a Disney-owned property. I suppose these two screenshots and the rampant speculation that comes with them will have to hold us until the next drip of information.